Back in 2008, Dream Theatre drummer Mike Portnoy dreamt up an idea of a sort of prog-rock "super tour" to bring the music to the masses. Thus was the Progressive Nation launched, and over the course of two North American and one European tour during 2008 and '09 – fronted by Dream Theatre and including three other bands hand-picked by Portnoy – the package tour showcased a variety of prog-minded bands. After a five year hiatus, Progressive Nation is returning, this time on the high seas. 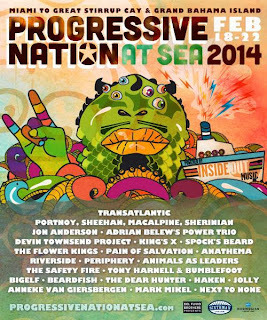 The Progressive Nation At Sea will be a floating party featuring some of the best of brightest from the prog-rock and metal worlds. Launching from Miami, Florida and sailing to Great Stirrup Cay and Freeport, Bahamas, the Progressive Nation At Sea cruise will run from February 18th-22nd, 2014 on the Norwegian Pearl ship. The ocean-going festival will feature 40+ shows on multiple stages as well as jam sessions that are sure to get the big boat a rockin'! Sponsored by Inside Out Music, Progressive Nation At Sea features a veritable "who's who" of prog-rockin' talent, including Portnoy and his former Dream Theatre bandmate Derik Sherinian, prog "supergroup" Transatlantic (with Portnoy, Neal Morse, Roine Stolt, and Pete Trewavas), former Yes frontman Jon Anderson, Adrian Belew's Power Trio, the Devin Townsend Project, Spock's Beard, King's X, the Flower Kings, Pain of Salvation, Anathema, Bigelf, Beardfish, Jolly, Haken, and many others.